Don’t arrive in holiday mode and expect to conquer Champagne Sports Resort golf course, it is worthy of its elevated status, writes MARK SAMPSON in Compleat Golfer. The central Drakensberg is well known for its clean, crisp air and spectacular views. What is not often mentioned is that it offers one of South Africa’s best golfing experiences. The Champagne Sports Resort golf course is by no means a gimmicky resort course aimed at the casual golfer; it could quite easily host a top-notch tournament and test the best. 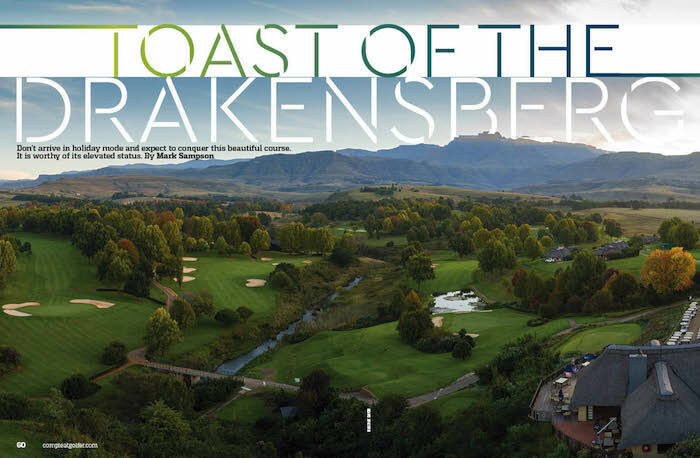 Even disregarding the location, the course is breathtaking, with rolling fairways, lined by trees, and ample water hazards all overlooked by the two highest points of the central Drakensberg range, Champagne and Cathkin peaks. The clubhouse balcony offers the best vantage point, which is probably why it was once rated as one of the best in the country. If you visit in autumn, this course will leave you in awe of the views and vivid orange to red shades along the fairways. The course designer, former Tour pro Hugh Baiocchi, would agree it is one of the most scenic locations on which he has had the privilege of working. But don’t let the beauty disarm you. The kikuyu fairways and bent-grass greens stretch 6 203m from the club tees and a whopping 6 694m from the tips. It screams out for a big tournament as it tests your entire game, from accuracy off the tees to bunker play and putting on large greens that, when cut down, can reach alarming speeds. It has a number of long holes, with the first taking the honours with a length of 605m from the tips. Bearing in mind the high altitude and the extra distance the ball flies, it is wonderful for the ego, especially in winter when the fairways dry out. It is a par five of 494m from the club tee that slides from right to left. A number of bunkers lead up to the green, with one on either side of the ‘entrance’. It is reachable in two for the longer hitters. Holes 2 and 3 present the first tests in terms of major changes in elevation, with the 2nd dropping dramatically down to the green beside the Sterkspruit River. The course then turns back up to the 3rd, over the river, up to the green a short 324m away. The par-three 4th at Champagne Sports is the signature hole. Walking on to the tee will confirm the reason: it is postcard perfect. Check out the pro tip on how to avoid a watery demise on page 66. The course then continues with a short par four of 347m and a par five of 497m before reaching the short 7th. This hole is also a close contender for one of the prettiest par threes around. The elevated tee looks down to the green, which is protected by a small river running down the left side and crossing in front. At 146m, it’s an 8- to 9-iron for most, but the drop, water left and thick bush right can make it a tricky target. The back nine has a number of stunning holes as you play towards the mountains. Starting with a par four of only 265m back over the Sterkspruit, it’s a great risk-and-reward hole, offering a strong birdie opportunity. As the course meanders away from the clubhouse it offers some long par fives and a par three that must have one of the prettiest gardens in the country leading up to the green. The holes that will stick in your mind long after the round is over are the 15th and 16th. The par-five 15th is long at 464m and going for the green in two is treacherous, as it is protected by a large water hazard diagonally across its entrance. It plays straight towards the mountain with a sloping fairway that is hard to find, especially in the winter months. A small pot bunker in the lay-up area spells disaster. Turning back to the clubhouse, another stunning par three awaits with water leading the eye to the green, where a number of bunkers and large trees surround the surface. The greens can be difficult targets as you play back over the water hazards and five bunkers. These two holes are breathtakingly beautiful but can also ruin a good card in no time. The final hole is a 371m par four back over the river with a water hazard short of the green. It sums up the course perfectly: accuracy is a premium and if you miss the fairway or the green, you are in trouble as the river runs alongside it. It’s a fitting finish to this enchanting course and a well-deserved stroke two. The course underwent changes in 1999 by one of South Africa’s tennis greats, Kevin Curren, who also happens to be the man behind the resort opening in 1996. After the addition of 40 hotel rooms and four more luxurious executive suites in 2010, the resort’s accommodation consists of 152 rooms and 91 timeshare chalets. In total, the resort can host up to 750 guests at any one time and has numerous conferencing options for any delegation size. Apart from the obvious option of hikes in the ‘Berg’, of which there are many, tennis, mountain biking, horse riding, fishing, volleyball and bowls are just some of the many activities available on site. The wellness centre includes an upmarket salon and well-fitted gymnasium. A number of activities and attractions can also be enjoyed a short drive from the resort, including the Falcon Ridge birds of prey show, the world-renowned Drakensberg Boys Choir and a canopy tour, for the more adventurous. The resort caters for all ages and needs and is a great option for golfers and holidaymakers. Without doubt the golf course falls into the category of ‘must play more than once’ and your score generally improves as you get to know its lines and idiosyncrasies. The perfect excuse to return to take on the layout again and enjoy the mesmerising surroundings.